Strawberries have 50% less calories than all other fruits. The other berries have about 15% less calories than other common fruits. DNA synthesis and protection from oxidative damage and infection. The selenium content in blackberries is 75% higher than other fruit; raspberries and strawberries also have 50% more. Iron is another. Fruits are a source of non-haem iron for vegetarians and vegans (red meat is a haem iron), and raspberries and strawberries have a higher iron content then all the other fruits. Strawberries have 120% of the RDI for Vitamin C, which is on par with oranges. Blackberries have the highest Vitamin E content of any fruit – almost four times that of an orange, grape or pear and nearly 12 times that of a banana. 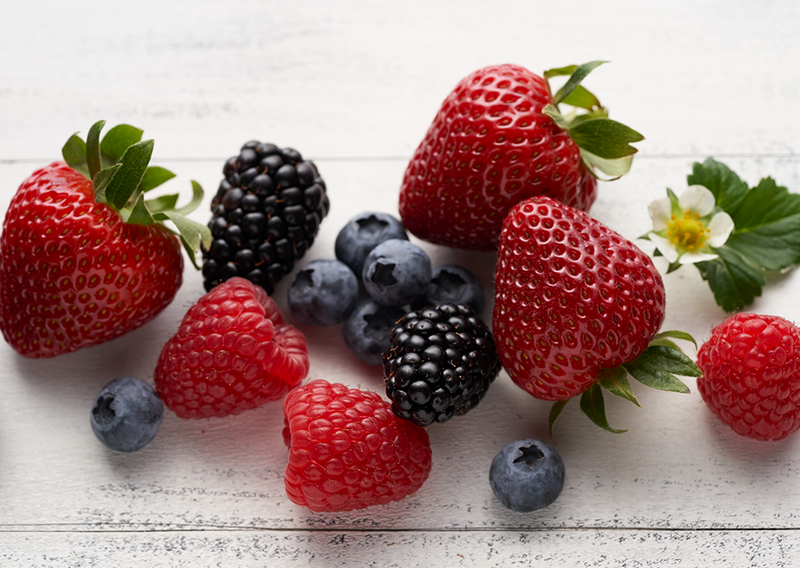 Berries have the same amount of folate as kiwi fruit, oranges and bananas, and four times more than pears. Strawberries contain 80% less carbohydrates than bananas and 74% less than grapes. Raspberries and blackberries have a very high fibre content (range 5.6-6.1g/100g) when compared to most other fruit (range 1-3g/100g). Blackberries have the same protein as a banana.